Our next project goal is to provide public access inside the 1846 Blodgett House. Architects Kirsten Kingsley and Keith Ginnodo have developed specific plans for interior renovation work that will permit visitors to appreciate unique construction features of this mid-19th Century home, as well as the Blodgett Family’s role in the Underground Railroad. Conceptual plans for interior renovation of the 1846 Blodgett House are explained on the Project Plan page of this site. An engineering study showed that reinforcements for the floor supports were needed to ensure the safety of members of the public who visit the House. The required structural work was completed in March 2014 under a contract let by the Park District. In June 2014 the Park District was notified that it received a state museum grant of $135,500 for help with interior restoration and interpretative exhibits. This grant is now in the process of being released after having been suspended for four years due to state budget problems. In 2016, Lovejoy, Inc., a Timken brand, opened their world headquarters on Wisconsin Ave. and became a member of the Downers Grove community. 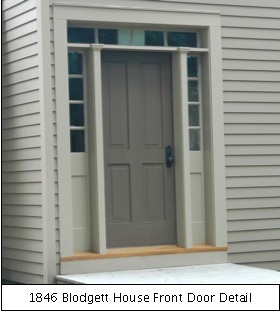 In October 2018 Park District received $50,000 from the Timken Foundation to support work on the 1846 Blodgett House. This award was presented by Mat Happach of Lovejoy, Inc. The interior renovation schedule envisions that construction could start sometime early next year, leading to an occupancy permit for the 1846 Blodgett House and a grand opening of the House for the general public in 2019. 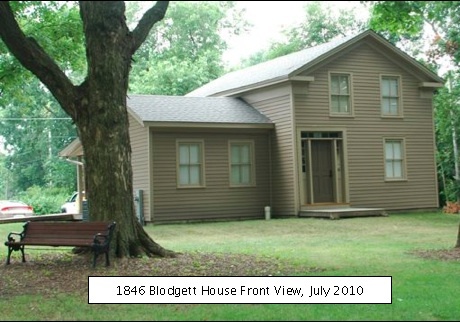 Now that the 1846 Blodgett House has now been restored to its mid-19th Century appearance, Commissioners of the Downers Grove Park District have accepted ownership of the House and terminated the District's lease agreement with the Heritage Preservation Corporation. At the Park Board meeting on January 19, 2012, President Charley Smart expressed gratitude to the Park District and the whole community for their great support. He also presented our group's donation to the Park District of $5,000 to help with interior renovation efforts and spoke about our continuing volunteer involvement in this project. 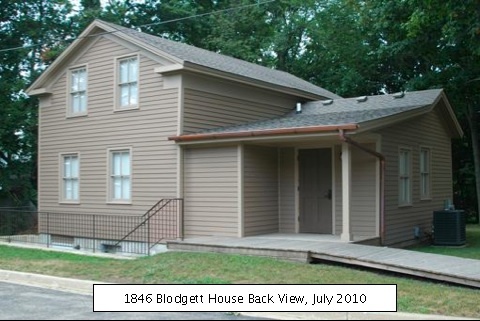 The Park District was advised in August 2012 that it has been awarded a new project grant of $15,000 for all costs associated with Phase 1 of the Blodgett House Renovation and other capital improvements. This grant from the Build Illinois Bond Fund is authorized by legislation first approved in 2009. Park District staff members are currently completing the paperwork associated with this very useful and timely grant. A generous donation by the Illinois State Questers has been matched with $2,000 in Park District funds thereby making possible the recent installation of three exterior signs for the 1846 Blodgett House. Two of these new displays are pictured below. Next time you come to Wandschneider Park be sure to look for this informative signage. 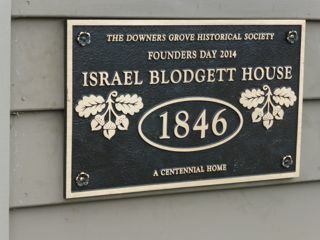 The 1846 Blodgett House was honored as a Centennial Home by the Downers Grove Historical Society on Founders Day 2014.